Hooray! 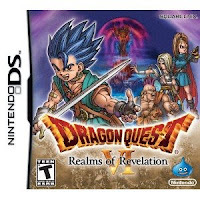 I was getting worried there for a moment, but at long last, the DS remake of Dragon Quest VI gets a release date: February 14, 2011. Officially titled Dragon Quest VI: Realms of Revelation, I stumbled on the Amazon page earlier today and my heart almost skipped a beat. So corny. But honestly, it's been forever since we've heard a peep about this game, and I figured that North America would never see it released. Glad to be wrong! I mean, even the official site hasn't been updated in years. So psyched! I am still playing Dragon Quest IX. I am stuck on the "Dreadmaster" boss battle. Even though I have slowly warmed up to the graphics, I honestly enjoyed the DQ IV and DQ V remakes SO MUCH MORE than Dragon Quest IX. It's a disappointment. I mean, all the DQ ingredients are there, but it feels so by-the-numbers. Town, talk to NPCs, dungeon, level up, boss battle, new town, repeat. It is missing whatever that special "DQ magic" is. Perhaps the characters just aren't as charming as in previous iterations? Or maybe it is more fun as a multiplayer game? Dunno. But I am super excited for the final chapter in the Zenithia saga, and I would really like to finish Dragon Quest IX before it comes out.